It's a sea of red! "There are only two kinds of people, Italians and those who wish they were". It's here! The Melbourne Tomato Festival has finally arrived! This Sunday, 21st February, 2016, the leafy green suburb of Eltham will be turned into a sea of red! Guy Grossi, his family and the Melbournese Movement pay homage to the humble tomato as a celebration and preservation of the Italian tradition of preserving tomatoes for their use throughout the year. The Melbournese Movement defines our place, where Italian and Australian heritage come together and where food culture and traditions are ingrained as part of our identity. Rooted from generations before us, Italian culture is one that reflects its regions, produce and its people and their lifestyle. Melbournese is a movement, which preserves the strength, and pride of our Italian culture while evolving to create new traditions that respect our current home" (Melbournese Movement). So today, you don't have to be born in Italy to be Italian or wish you were :) We can all be Italian for a day this Sunday at the Melbourne Tomato Festival and "National Italian Day", celebrating the humble tomato and all things Italian. There'll be Italian food and beverages, music, entertainment, guest speakers, farmers produce markets, celebrity chefs, a tomato growing competition, cooking demonstrations and hands on passata making workshops. The crew from Home Make It will be running back to back, hands on passata making workshops throughout the day, so be sure to get in early to book your spot. And please, come and say hello and introduce yourself to a member of the Home Make It team. We'd love to meet you! The Melbourne Tomato Festival will be held on Sunday 21st February, 2106 at Edendale Farm in Eltham between 10am - 4pm. Tickets available for pre-purchase only until sold out. You can purchase your tickets ONLINE. The inaugural Melbourne Tomato Festival was a sell out last year, so avoid disappointment and purchase your tickets now! Adults $25, Children 6-13 years $10 and Children 5 & under FREE. It's promising to be stunning weather this Sunday, so hop on your bike or catch a ride in on the train or bus. Parking is available, however will be limited. Photo: Justin McManus. Cade and Bonnie Butler teach their son Odin how to do it yourself. In the lead up to the Melbourne Tomato Festival, Journalist, Suzanne Carbone, The AGE wrote a fantastic article this week titled, "Hipsters squeeze out the Italians in the art of making passata at Melbourne Tomato Festival". Follow the link to read the full article. Photo: Justin McManus. Cade Butler and wife Bonnie fill bottles with homemade passata. The article features our very own Cade Butler and his lovely wife Bonnie Halliday.Their passion for homemade produce has been dubbed as "saavy DIY hipsters", and much to Cade's horror they are creating new traditions in their family making passata, salami and preserving olives. It's a family affair proving you don't have to be born in Italy to make Italian food and drinks! The article also features the upcoming CERES Fair Food, community Crowdsaucing Day on 30th April, 2016 in neighborhoods all over Melbourne. Crowdsaucing Day is an opportunity for communities to come together to bottle locally grown and organic tomatoes to be used throughout the year. Crowdsaucing promotes sustainable food practices and fairly traded produce. Follow the link to CERES Fair Food if you want to sign-up for the Crowdsaucing Day or join their fair food movement. If you can't get along to the Melbourne Tomato Festival this Sunday you can join us at The Craft & Co on Sunday 6th March, 2016 for the Craft Day Out where we will be running more passata making workshops throughout the day. The Craft Day Out is a unique "foodie" event as part of the Melbourne Food & Wine Festival. And what a day out it will be! If you have ever wanted to learn how to make artisan produce such as passata, salami, cheese, wine and beer. There will be a full day of interactive workshops, demonstrations and appreciation sessions with the masters of their trade including That's Amore Cheese, The Meat Room, Rob Dolan Wines, FB*PROPAK, Archie Rose Distilling Co. and of course, the crew from Home Make It. Enjoy a shared table feast lunch comprising of freshly made produce by The Craft & Co, Head Chef, Dom Marzano. The Craft & Co is the newest kid on the block at 390 Smith Street, Melbourne. If you're into unique food and beverage experiences, then you'll love this venue and concept. All under the one roof, a brewery, distillery, deli, cafe`/restaurant, retail space, bottle shop, cheese and meat rooms. Don't miss out on this fabulous event, limited spots available so book your tickets via the Melbourne Food & Wine Festival program ONLINE now. Hi Brewers, I can't believe it's almost the end of February already, so much to tell and on the horizon! I was like an excited kid at Christmas when we received some new and fresh hops from the Crosby Hop farm in the USA. We got in Cascade, Chinook, Columbus and a couple of experimental hop varieties: Idaho #7 and Idaho #6. So if you want some fresh big USA hops for your next recipe, you know where to go! Along with those we have an extensive range of Wyeast and Whitelabs pure pitch yeast. We even have a few sour beer inducing Lacto & Brett bugs in there too for those adventurous brewers out there. Starting at our Reservoir store soon, we will be expanding our equipment hire range to include an all grain brewing kit. The amazing SS Brewtech Mash Tun & 38L kettle, this will convert any extract tin brewer to the All Grain side of the force in a single afternoon. Home Make It are proud to team up with Melbourne's newest brew club, the Merri Mashers and fab new venue The Craft & Co to bring you the BREW FC Competition. This is a home brew comp with a difference, instead of brewer vs brewer this is club vs club! We are pitting Melbourne's best brew clubs against each other in a test of Stouts & Porters for a chance to win bragging rights and a chance to win a tap takeover at The Craft & Co. Let's get ready to ruuuuuuuuuuuuuuuuumble! Our in store 2016 calendar for food & beverage workshops is action packed! Click on the link for all the course dates, venues and details. Our workshops are hands on, fun and interactive. To participate in one of our great courses, just book your spot ONLINE or call our Clayton or Reservoir stores for assistance. Our newly renovated Clayton store is almost ready to roll out all the new facilities that will be available to our customers. Only a few more weeks and we'll be ready! I don't want to give too much away, but I can give you a few clues. Think coffee, panini, sit, play, learn, create... Without giving anything else away, I can also show you some recent pictures of the renovated store. Home Make It has recently expanded to include a Wholesale & Trade division which has been launched to help supply businesses nationwide with quality, unique food and beverage making equipment – be it for the consumer or the trade-user. Our broad product range has been developed to help supply every type of business, from home brew stores to breweries, from kitchenware or bar-ware to shops and restaurants. Follow the Wholesale link to learn more about it. Check out our Gift Vouchers and Course Gift Vouchers also available instore or ONLINE. Enjoy the weekend and all this glorious weather! And if you are heading over to Edendale Farm on Sunday for the Melbourne Tomato Festival, be sure to come and say hello to the crew! "You say tomato, we say passata!" It's that time of year again when Melbournian's pay homage to the humble tomato thanks to the passion and vision of Guy Grossi, his family and the Melbournese Movement. The iconic Melbourne Tomato Festival, now in its second year and growing in popularity and magnitude, is quickly becoming one of Melbourne's most popular culturally driven foodie festivals. The Melbourne Tomato Festival will be held on Sunday 21st February, 2106 at Edendale Farm in Eltham between 10am - 4pm. The festival would not be complete without the hands on passata making workshops, and that's where the crew from Home Make It come in! We'll be running back to back passata making demonstrations all day long, so join in on all the fun and learn to make some authentic passata with us. This is a ticketed event only, until sold out, so don't miss out! The event was a sell out last year, so avoid disappointment and purchase your tickets online now! We are thrilled to be joining the collaborations of all collaborations at this years' Melbourne Food & Wine Festival for the Craft Day Out, it's happening at the newly established and unique artisan food and beverage venue, The Craft & Co at 390 Smith Street, Collingwood on Sunday 6th March, 2016. The Craft & Co incorporates an onsite brewery, distillery, cured meats and cheese preparation rooms, training facility, retail and gift store, bottle shop, deli and cafe/restaurant. It's truly amazing to see all these things under the one roof, make sure you drop in to check it all out. The Craft Day Out is a series of rotating appreciation and workshop sessions with some of Melbourne's best artisan producers including That's Amore Cheese, Archie Rose Distilling Co., Rob Dolan Wines & Winestock, The Meat Room and FB*PROPAK. Come along for a unique culinary experience in cheese making, winemaking, sausage making, distilling and passata making. Members of the Home Make It team will be again facilitating the hands-on passata workshops. You'll also enjoy a shared table feast lunch comprising of freshly made produce by Head Chef, Dom Marzano. Don't miss out on this fabulous event, limited spots available so book your tickets via the Melbourne Food & Wine Festival program ONLINE now! Our instore 2016 calendar for food & beverage workshops is action packed! Click on the images below for all the course dates, venues and details. Our workshops are hands on, fun and interactive. To participate in one of our great courses, all you need to is book your spot ONLINE or call our Clayton or Reservoir stores for assistance. On behalf of the team, I would like to thank all our Clayton customers for their patience and support during our recent store closure over the Christmas period. Those who have returned to our store since its reopening last month will have noticed lots of changes already! But there's more to come, so watch this space! I would love to give away all the secrets of our new store, but you'll have to wait just a little bit longer. It'll be well worth it, I promise! If you're inspired to try your hand at passata making this season and looking for a good recipe, we have included two very different methods in our very first book titled The Makers: a story of food family and foreigners. Whether you're into the raw method or the cooked method, you'll be inspired by the stories of the Gangi, D'Aquino and the Merrett family passata days. These families are friends of Home Make It and share their recipes, processes, tips and stories. We hope you enjoy it as much as we did putting it all together! The Makers: a story of food family and foreigners makes a great addition to the kitchen library as well as the perfect gift for lovers of Italian foods and traditions. Copies available for purchase at our Reservoir and Clayton stores, ONLINE and at The Craft & Co. Image: Donato & Lucia D'Aquino - Passata Makers. We look forward to seeing you at one of the many events and workshops coming up in February and March! The SALAMI season is here! - Carlo Mazzarella, Director, Melbourne Salami Festa. Ever wanted to be a fly on the wall at someone's salami day? Well here's your chance :). Check out the YouTube clip from the winner's of the inaugural 2012 Melbourne Salami Festa, BGS Group (Bloody Good Salami) for their "best homemade salami". The BGS Group are a group of cousins from the North Eastern suburbs. Their salami day helpers comprises of three generations and it's all hands on deck, commencing just before sunrise and finishing well after sunset. Pot belly stoves are lit, coffee is made in the traditional caffettiera and bacon and egg rolls are cooked on the grill. They feast on a lunch from off cuts of the pigs which is transformed into a slow cooked pork pasta ragu`. The long trestle tables are be adorned with cheese, last years salumi, red wine, salads and crunchy bread. The mincer machine is drowned out by the sounds of children's laughter and cheeky antics as they come in and out to offer small bouts of assistance. The uncles are quick to criticise the next generation and make comparisons of their own traditional methods of making salumi. Fortunately, this is mostly done in jest so the mood of the day is light and jovial. 18 hours later, there is enough salami and fresh sausages to last a year for all the families present. Notes are taken, ingredients measured and processes documented, in the event that they win or place again in the Melbourne Salami Festa competition, so that it can be replicated the next year. 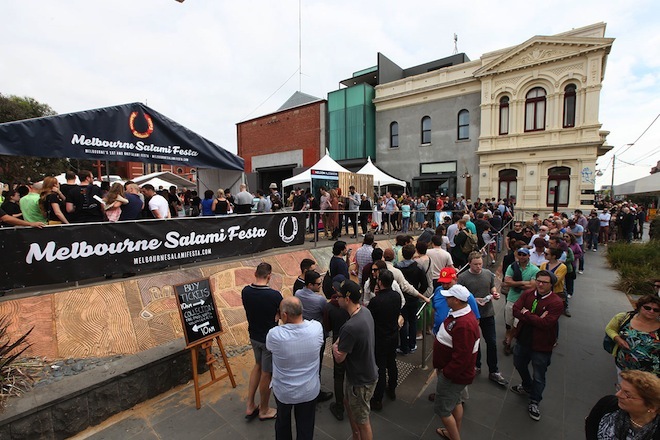 This group like so many families around Melbourne absolutely love their annual salami day! It's not just about creating homemade salami and fresh sausages, it's also about enjoying time together as a family, preserving traditions and creating life long memories for their children. For those that have already joined the "salami army", and been to one of our food & beverage courses, then now's the time to transform your suburban garage into a salami and sausage making factory! Try out Frank Bovezza's hot Italian salami recipe below, he's not shy in proclaiming it to be "the best"! If this all sounds nice and the image above has your mouth watering, but you have no idea how to do it, then you haven't been to one of our Salami Making Courses! Don't be fooled, there's nothing "simple" about making salami! Curing and storing your salami safely requires the correct knowledge, and we can teach you how! Join us for a fun, hands on and social workshop where you will learn all the tricks of the trade and everything you need to know to make awesome salami for your friends and family to enjoy all year around. Even Nonna Paola is getting in on the action in a recent YouTube clip! You can view our equipment and supplies ONLINE. Our shelves are fully stocked! All of our equipment is of the highest quality and ITALIAN made. Why not get together with friends or family to split the start up costs, and start a new annual tradition. And for the enthusiastic do-it-yourselfers, we have expertly put-together Sausage & Salami Kits and the matching various sausage recipe kits as well as salami recipe kits. All our Home Make It kits come with instruction manuals which include all the traditional secrets and know-how so you can make it your way and become your own salumiere. Due to popular demand, we are stocking the SICO Vacuum Sealing Machines again! Made in Italy and of the highest quality domestic machines! But, we've had to make room for them on our shelves, so we're offering 40% off all ELEGEN Vacuum Sealing Machines until stock runs out. Also Italian made and also of the highest quality. These are massive savings! Come in store this Friday or Saturday to stock up on all your equipment and supplies if you are making your salami this weekend. We are open until 5pm Monday to Friday and 3pm on Saturdays. Feel free to call ahead if we can get your order ready for you beforehand. Call Reservoir on 03 9460 2777 or Clayton on 9574 8222. It’s been a busy time indeed here in the Home Make it beer world! Firstly, we had a nice sunshine filled home brew demo on my backyard deck. A nice winter warming dark ale was made (recipe below) and it will be ready for tasting in about a month, cannot wait! We also headed over to see Christina's (editor of The Great Aussie Bite) beer, who wanted to make some beer. Being her first time, she and a friend each put together a Home Make It beer kit and the “battle of the beers" was on. Can’t wait to taste these battling beers! Speaking of battle of the brews, the Merri Mashers Brew Club held the worlds first ever "speciality IPA" beer comp at the Terminus on Sunday 14th June. Over a hundred beers from all over the country arrived and were judged. Very happy to say, a local Merri Masher member won the Home Make It sponsored White IPA section and I’ll be handing over the store voucher to Mattias at the next meeting. Congrats Mattias! On a store level, our grain offering is looking great. Be it full 25kg sacks of base grain, or little bags of Gladfield speciality malts, we have it. We have a new batch of White Labs liquid yeast hitting us late next week also, and good stocks of the shiny and wonderful SS Brewtech fermenters and boil kettles and new amazing STERILOCK waterless airlocks. Learn how to make homemade mozzarella cheese at our hands on, fun and interactive courses at our Reservoir and Clayton stores in June, 2015. Bookings ONLINE. Our Salami and Cured Meats Courses have now commenced, and bookings are filling fast. Our resident butchery expert, James Mele (& now superstar! Did you see him on TV on Vassilis Garden to Kitchen this week?) will give you the confidence to make your own salami and safely cure your salumi before the Winter is out. Our courses are hands on, fun and interactive. Numbers are capped so don't miss out! For convenience, they are offered at two store locations, Reservoir and Clayton. Bookings ONLINE. Cade will be launching his very own Introduction to All Grain Home Brewing Course in July at both the Reservoir and Clayton stores. Learn all about equipment needed, grains, hops, yeast, how to mill, mash and all maturation/fermentation and bottling techniques to make your favorite styles of grain beers. Book ONLINE. Click on our sale banner below for this week's specials. Included in this week's specials are 30% off selected salumi casings and netting and 40% off Elegen Vacuum Sealing Machings. Have a great weekend and happy salami days!